Nobody knows when the last goodbye is. Appreciate everyone especially those who cares about you before it's been too late. Farewell is not the end of life. But the first step to how strongly we survive without someone. Whenever you have to say farewell to someone don't ever say goodbye, say see you later or in till next time but never goodbye. 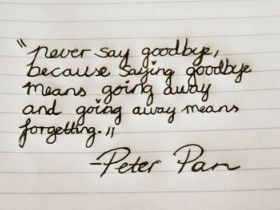 Saying goodbye is like saying see you never. Sometimes to someone you love you want to say goodbye, but you can't get the words out. 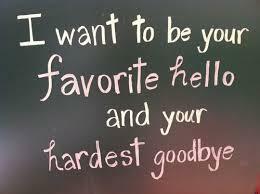 Because in your heart saying goodbye would just be a lie. One day, we'll never have to say goodbye, just goodnight. Oftentimes we say goodbye to the one we love without wanting to but that doesn't mean we stop loving them. Sometimes goodbye is just a painful way of saying I love u. Never beg people to stay against their will. Sometimes the gift of goodbye opens another door for you. Move on, and create the next chapter of your life. There is truly a good in goodbye... if there's no good, maybe it's not yet the end.